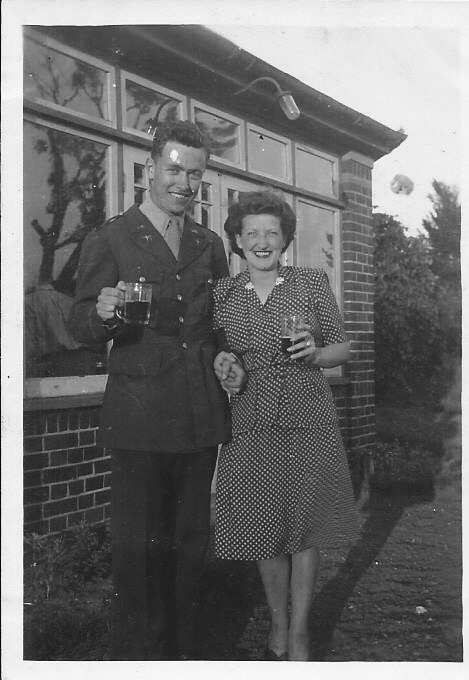 This picture shows Ruby Palmar (second from left), the landlady of the Greyhound Pub in Hethersett near Hethel (west of Norwich) with a USAAF airman, probably outside the pub. RAF Hethal became USAAF Station 114 in 1942. It was the HQ of the 2nd Combat Bombardment Wing, 2nd Bombardment Division from September 1943 to June 1945. The 320th and 310th Bombardment Groups passed through on their way from the United States to North Africa, and the base then became the home of the 389th Bombardment Group (Heavy), which was there from June 1943 to May 1945. If anyone recognises the airman please contact us. Many thanks to Ruby's son David for sending us these pictures.